Unlike ROMLister, the Simple MAME Category Sorter does not know anything about the controller configuration of a game. Another major difference is that the selection boxes and manual filters provide only “OR” search queries (on the left) and “NOT” queries (on the right). There is no provision for “AND” filtering. One thing it does understand is how to copy files, probably the only built-in feature this tool has that ROMLister lacks. For example, this is a set of MAME 2003 playlist filters inspired by Alexandra’s Pretty Curated Playlists guide. There are a number of subtleties present in Alexandra’s ROMLister scripts which the Simple MAME Category Sorter cannot reproduce though. One thing to bear in mind is that at least a few ROMs are copied into more than one folder/playlist with these filters. Appreciate your continued work and enthusiasm. I dislike this new forum style but I’ll prolly repair / recode my guide at some point. Given your continued script innovations I haven’t decided which is the best direction to update my guide with re: scripted tools. As you said, some subtlety is lost when you move to (the current) GUI scripts. Hearing ROMLister is more complex than ClrMamePro surprises me. I’ve bounced off that program several times but feel that my guide covers most of what’s necessary to harness ROMLister for curated MAME lists. You’re right that the RL wiki’s been down, and with no ETA for fix (I checked). I was trying to make adjustments to your filters to fit MAME 0.78 as well as my own tastes but it didn’t go smoothly. I was stating to get excited about using ROMLister from the command line which I was seeing references to in forums. Once I realized that I would not be able to get docs on that, the idea got stuck in my head to try building my own catver GUI. I see. You weren’t messing with the RL GUI, were you? I quickly gave up on that (it’s very limited and IMO confusing) in favor of writing queries by hand, as explained in the guide. Update today to make subcategories appear more intuitively in the interface. Plus some behind the scenes cleanup. Great Work at all !!! But maybe some Filters for Managing Roms which needs CHDs will be very usefull. 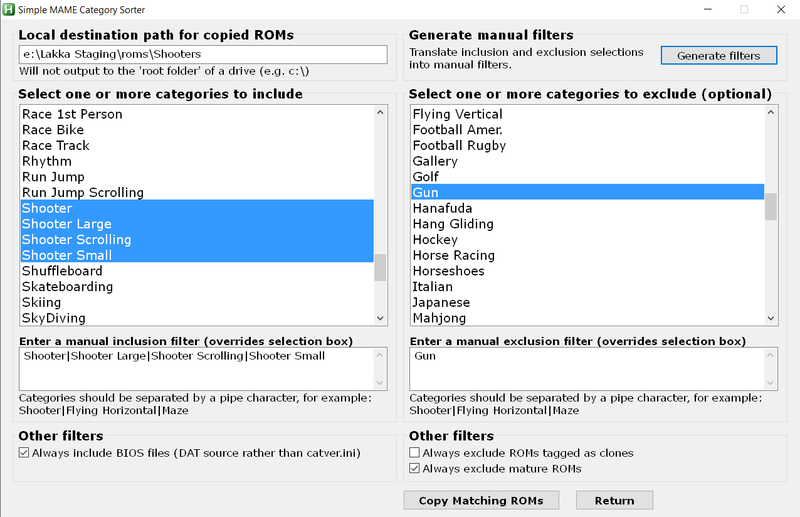 for example a option like “dont copy roms when matching CHD-files are missing”. CHD Fullsets are very hugh (arround 300-500 Gigabyte) and such a function will prevent of “dead roms” in the created Playlist if not a (complete) CHD-Set is used. Good idea. This will be on the todo list for the next version in a week or two. 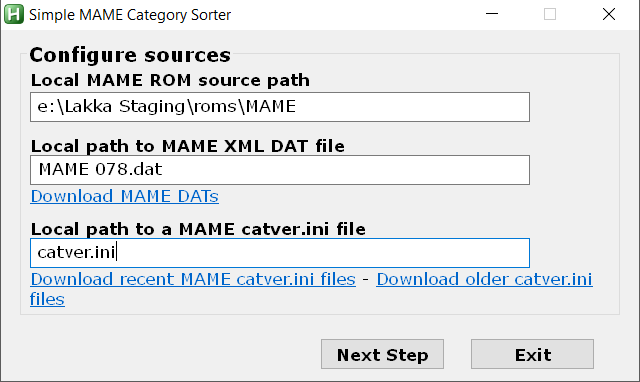 You’re right - earlier MAME listed those games in the catver.ini as “Unplayable.” Later games put them into the correct genre category in catver.ini and use an XML tag in the DAT file (runnable=“no”). Now that I know that it’s not a big deal to account for the format change. (This will be the fourth format variation in the code ) The problem is that I’m not able to do much testing where I am now. Otherwise I will try to test this within a week or so once I’m at my desk. will give a try but have trouble with rebuilding romsets and/or mame2014 core. manymany games wont run under lakka. can it be that mame2014 can only handle non-merged roms and no splitted roms ? working with your Category Sorter is a true pleasure! Updated the build today to reflect some changes in retroarch-playlist-helper-lib designed to better support FB Alpha DATs. Since I was rebuilding, I also made some updates to the GUI to reflect that this app can sort FB Alpha collections as well as MAME collections assuming that the matching MAME catver.ini file is available.